Bluebird Sky Yoga has two studios, a sitting room, a friendly-looking front desk, and a collection of mugs and tea near a sink in the back of the building. The walls are decorated with eclectic art by local artists. Colorful, low-sitting couches in the lobby area are draped with fuzzy blankets. It feels less like a gym and more like a chic D.C. apartment. The yoga and meditation studio celebrated its two-year anniversary in early November, and occupies a space formerly belonging to a craft supplies store on Brookland’s 12th street. 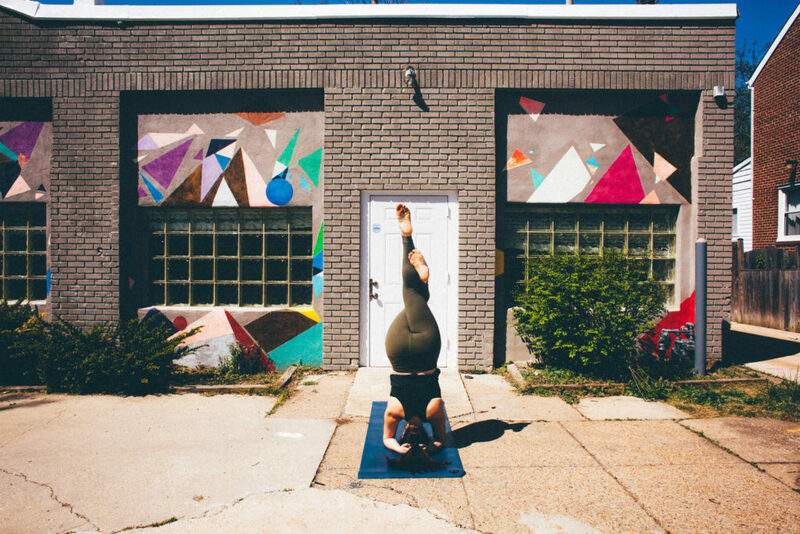 As dozens of yoga studios continue to appear in D.C., the challenges for studios like Bluebird Sky are ever-increasing. Each yoga studio needs the same thing: to brand itself in a way that will attract students and pay the rent. Jennie Light, the studio’s 29-year-old owner, is now approaching what business owners call the “hump year”: the benchmark for many business owners’ prospects of long-term success. Aside from being a craft store, the building which now houses Bluebird Sky was previously a computer supply store, an insurance company, and three different restaurants. When Light and her team purchased the building, the flooring of one room was made entirely out of carpet samples. There was work that had to be done to turn it to what it is today. Ceilings needed to be replaced, bamboo flooring needed to be installed, and walls needed to be blown out and moved to make room for the spacious yoga studios. Luckily, Light is more than just a yoga teacher. She worked for years as a financial consultant, which allowed her to have a clear understanding of business and negotiation. Still, starting a business from scratch did not happen overnight. Engineers needed to be brought in to install an entirely new heating and air conditioning system. And oftentimes, Light needed to get creative. The studio offers a variety of classes, from maternity yoga to more pilates-centered core workouts, to breath-moving “vinyasa” classes. Bluebird Sky has had a strong retention rate for instructors, and most have been with the studio since opening day two years ago. Part of the studio’s philosophy is to offer a wide range of classes from instructors with varying backgrounds, providing students with exposure to a variety of different styles of yoga. While most of the instructors have a spiritual background, some teach in a more secular style, skipping the mantras and focusing on breath exercises instead. With no other yoga studio within a two-mile radius of Bluebird Sky’s corner lot in Brookland, Light saw a need that she could fill. Catholic University’s nearby campus and a growing population of young families in the neighborhood made the quiet corner lot in Brookland even more appealing to Light and the Bluebird Sky team. The studio is nestled less than a mile from campus and a large population of CU students have taken advantage of the reduced student rate for classes and membership, like 21-year-old economics major Abby Fitzgerald. “I like that I can decide 20 minutes beforehand that I can go to a class, so it’s really convenient in that sense,” said Fitzgerald, who has practiced yoga recreationally for the last year. Fitzgerald also said that she enjoys yoga as a social activity to attend with her friends, and has attended the core power and stretching classes. Bluebird Sky is planning to launch an ambassador program with Catholic University in the coming months, where students can earn class credit by promoting the studio on campus. A number of CU students and graduates have attended yoga retreats through Bluebird Sky. Larissa Hawkins, a junior from Baltimore, has taken classes at the studio since her freshman year. Only time will tell whether Bluebird Sky will be able to avoid the fate met by the computer supply store and the insurance company, but the bustle of students moving in and out of the studio on a cold Wednesday night seems to signal that Bluebird Sky isn’t slowing down anytime soon. Neither is Jennie Light, who continues to teach six classes each week. While Brookland may not typically be a destination for D.C. locals, the staff at Bluebird Sky feel that an active sense of community in the neighborhood makes up for any lack of outside attendance. Light, a Brookland-dweller herself, feels that people in Brookland are willing and excited to support local businesses and artists, and that the other business owners on the block are happy to collaborate. Light feels that this is truly the key to a successful neighborhood business: a community that people feel like they can be part of.